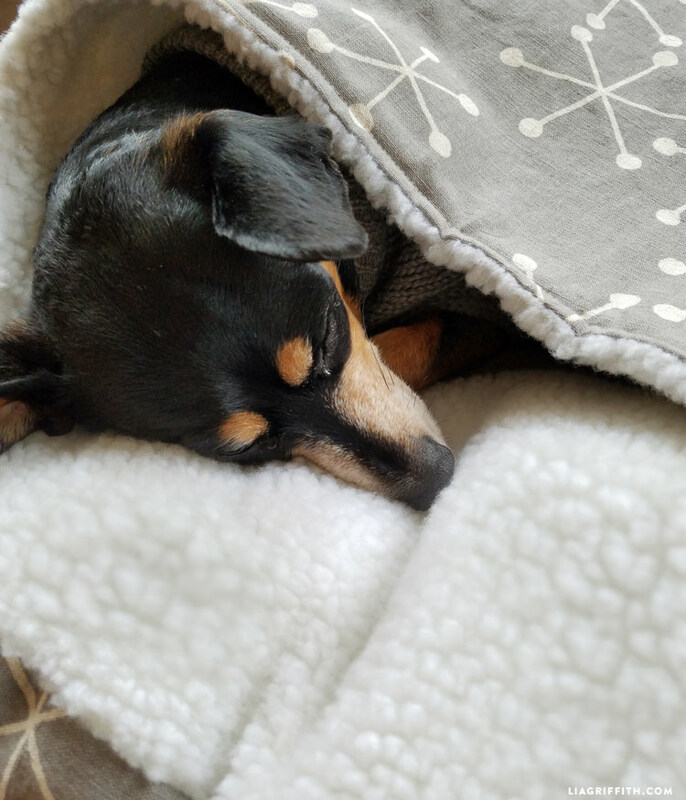 Become a member and download the pattern and instructions for this perfect burrow friendly dog bed today! My dog Enzo is part dachshund, so he is quite the burrower. Some people in the studio like referring to him as our resident burrito dog! He’s always diving into a pile of blankets and wrapping himself up so you can barely see his little face popping out. 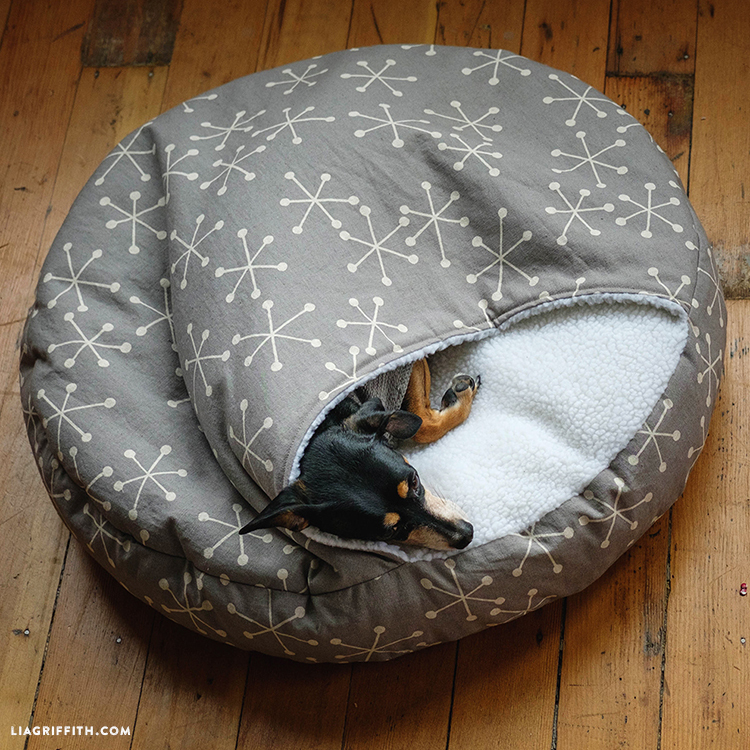 This adorable habit led to the inspiration for making a DIY burrow dog bed. Ever since sewing this up he has barely left his new bed! Print 3 copies of the template at the bottom of the post, one for each piece of the pattern. Following the diagram, cut out and assemble the pattern with tape. Once you tape together the DIY burrow dog bed template, find guidance for cutting your fabric in the printable instructions below! Then follow along and use the photo tutorial for visual reference. This project is a bit more advanced, so we recommend that more seasoned seamstresses take on this DIY. It can also be a welcomed challenge for anyone wanting to explore their sewing machine’s potential! Head to your local fabric store or browse online to find a fabric that matches your dog’s personality. We chose the Kaufman Sevenberry Canvas Cotton. We added a zipper to the side of our homemade dog bed so that we could easily remove the cover to throw it in the wash at any time. For tips on how to sew a zipper into the fabric, you can watch our instructional video on how to sew a basic zipper pillow. 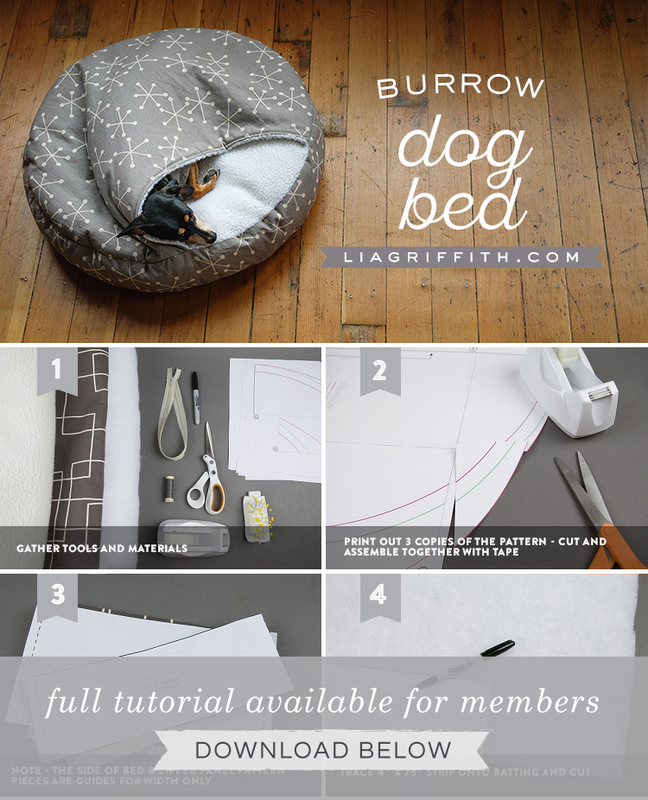 That’s a great tutorial for Burrow dog bed. 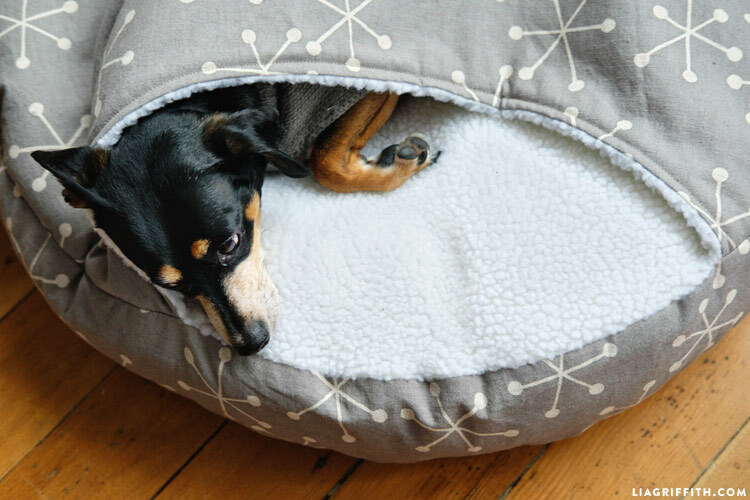 This Burrow dog bed looks comfortable and hope little pups enjoy and warm. I have little ones cute breed and I hope this bed suitable for him. Can two or more pups share it just one bed? Hi, this is a great tutorial! Could you tell me what is the diameter of the bed? I’d like to use an orthopedic foam insert for my older fury lady and was wondering if this would fit a 26” diameter and 3.5” height. Thank you! Lisa , my baby looks just like yours, mine is a mix , dachshund and not sure what else, what is your breed? Reece is a rescue..love the bed. Will this lovely dog bed be big enough for an 18 lb. dog? Thank you. Does the pattern include a size to fit a 65 – 70 lb golden retriever? Say, 42 inches diameter? Hi Mary! No, we only created this burrow bed in a small size. We hope to expand to larger sizes for other pups that enjoy burrowing sometime soon! I cant wait to make this. As I’m typing this my miniature pinscher is on my lap under the blankets. Shes ALWAYS under blankets even when it’s 90 degrees outside.. shes my cuddle baby!!! I love to make things for my Dog too! Has anyone made this but larger? 🙂 Any tips? My dog liked this a lot ! It keeps her really warm but the only funny thing is that she just sits on top of the cover. This is really great. It’s a very helpful tutorial. 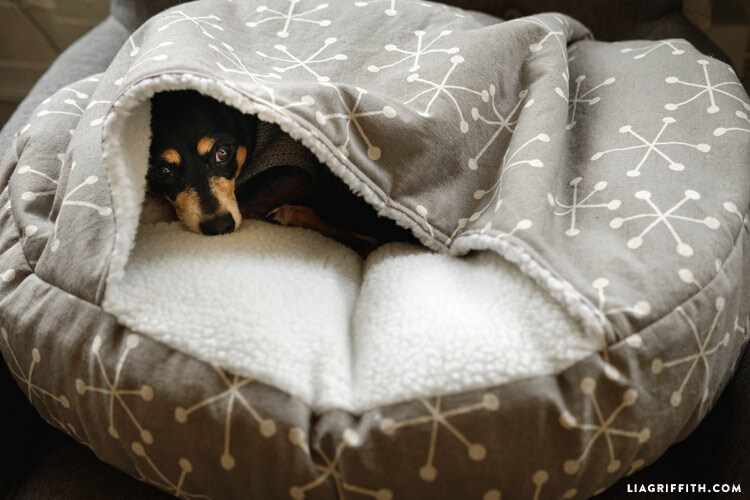 It has a very unique design for your dog to snuggle up in and feel protected and warm. 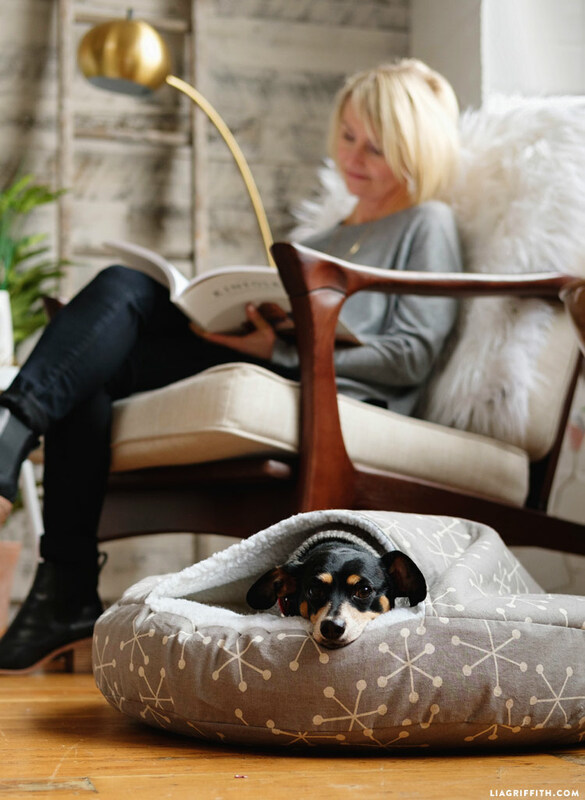 These nesting dog beds are ideal for pets that enjoy tucking themselves away in enclosed spaces. My dog is a little bigger than a Doxie but he absolutely loves to burrow and snuggle under blankets. Do you have a modified version for medium sized dogs?? I know he would absolutely love this! I’m sorry, we only have the one size! Because of the complexity of the project, we decided on just this one. What about just scaling the pattern up? will that work to make it bigger? I have frenchies. That works if you are able to print! It may only work on 11×17. Hi,I just got the pattern, but I can’t seem to get the PDF to”email” to my hubby at his job to print for me. It just says “print”as only option ..so I’m stuck for now. I am long time experienced with pet sewing though,and can answer your question. You can take the pattern pieces and hand draw on them in smaller sections. Play around with printer,and do some percentage increases, providing your printer has the feature to resize..just by centering on each smaller section. start at least with a 20% increase. you will have ALOT of piecing to do, but the sky is the limit,and you can get many sizes..going way up for a big dog. As far as the band with the zipper,you don’t have to run that again…just make it to fit around your new top and bottom pieces,and add equal height to top and bottom of strip only if you want a taller bed.of course you would add more fleece. I plan on doing mine with no clump filling,in seperate washable pillow inserts,instead of quilt batting. yorkies and shih tzus like lumpy bumpy..ha!! Section off your flappy hood part also,if you want to keep it exactly proportioned as it is, or make it even bigger,so dog has more opening to get into…have fun,Rose in NJ. Thank you Rose, I appreciate your help with this!! As for the PDF trouble– make sure you’re downloading it to your desktop. If you’re downloading it/opening it in a browser window, it likely won’t give you the option to email. This is such a clever idea with a win win solution to my couch always looking like a pile of unfolded blankets. I have a Min Pin and 2 Chiweenies that spend 1/2 their Life (lol) under blankets. I’ll let you know how the beds turn out. I am going to make this for my cat! He will love it. He loves to burrow and he loves beds. I am also going to make a matching pillow as he always uses a pillow when he sleeps on our bed, or on the sofa. He thinks he is a person! Absolutely darling idea!!!! If my four poodles would even consider them, I’d make them. However, they now prefer our bed with our warm bodies and lots of pillows to sleep on or under or next to depending. Yes, they’re unbelievably spoiled, but that’s what they’re here for. At 75 they keep me moving and are great company and entertainment! Love this Lia! ❤️I have 2 dachshunds, so I guess I will be making 2 beds. So excited about the new Cricut Maker.. hoping you will be part of the sewing designs in design space! Love this. My little shih tzu loves burrowing under blankets, cushions, you name it. Going to make this my weekend project. This is such a great tutorial. I will have to try it out! I have a dachshund and he LOVES to burrow under anything warm and comfy. I know he would be very happy with a bed like this! Love, love, love all of your creations and ideas. You help keep me busy and HAPPY! Thank you so much. I’m sure cats would like this as well. Thanks. the pattern for burrow dog bed won’t download for me instructions did suggestions? The pattern will download as a zipped folder– check your downloads or desktop? I thought it was just a funny trait of my part dachshund mix Homer. He is a real burrower, too, and it isn’t just with a pile of blankets. Anything can be a target as evidenced by the scratched up (and ruined) carpet in my bedroom. I love this, thanks so much! Yes both our doxies did that too take care of yours we love them so much and even spent money for a back surgery on them NO jumping down off couch the vet said that’s the worst on their backs!